Soak planks for 1 hour or more. During the last 30 minutes of soaking, create the glaze: Melt the ghee over low heat. Add the thyme and stir for 30 seconds, or until fragrant. Add the honey. Stir for 30 seconds, or until honey is fully melted and well blended. Add balsamic vinegar, bring to a boil, reduce heat to low, and simmer until reduced by half (about 20 minutes). Remove from heat and set aside. As the glaze cools, it will thicken. Salt and pepper the salmon and heat your grill to medium-low, about 350 degrees. Place the planks on the hot grill, for 1 minute. Then, place salmon fillets on the planks, close lid and cook for 8-10 minutes. Brush the tops of the salmon with the thyme-balsamic glaze. Close lid and cook for another 8-10 minutes, or until salmon is flakey to the touch of a fork. Serve on a bed of greens or with your favorite grilled vegetables. If you enjoy this recipe, please share it! Follow us on instagram, twitter, Facebook, and subscribe (see the menu above). 1. Soak planks for 1 hour or more. During the last 30 minutes of soaking, create the glaze: Melt the ghee over low heat. Add the thyme and stir for 30 seconds, or until fragrant. Add the honey. Stir for 30 seconds, or until honey is fully melted and well blended. 2. Add balsamic vinegar, bring to a boil, reduce heat to low, and simmer until reduced by half (about 20 minutes). 3. Remove from heat and set aside. As the glaze cools, it will thicken. 4. Salt and pepper the salmon and heat your grill to medium-low, about 350 degrees. 5. Place the planks on the hot grill, for 1 minute. Then, place salmon fillets on the planks, close lid and cook for 8-10 minutes. 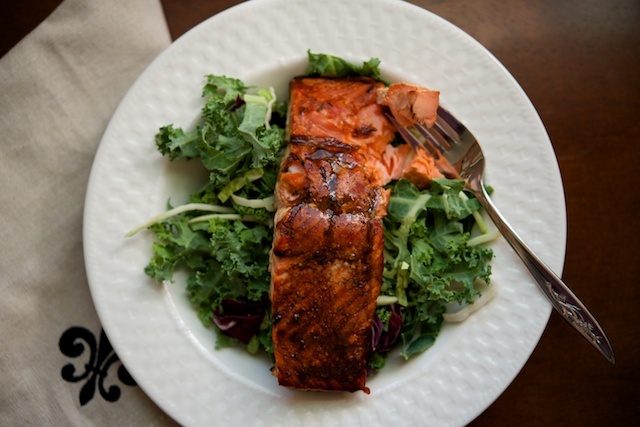 Brush the tops of the salmon with the thyme-balsamic glaze. Close lid and cook for another 8-10 minutes, or until salmon is flakey to the touch of a fork. 6. Serve on a bed of greens or with your favorite grilled vegetables.